As a cold front blasted through the area on Sunday afternoon, temperatures fell nearly 20 degrees in a 2 hour time period. Chilly temperatures will grab local weather headlines through Ash Wednesday. 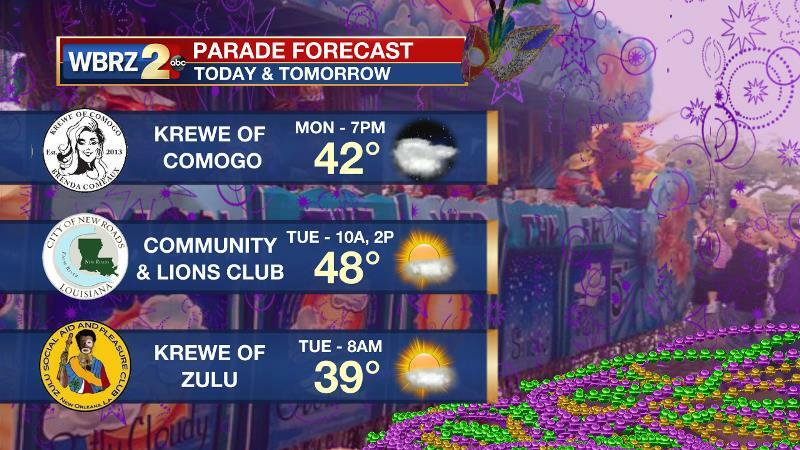 Today and Tonight: Clouds will pester skies through much of your Lundi Gras. A bit of late morning and early afternoon sunshine will allow temperatures to nudge into the upper 40s, but not much warmer. North winds of 10mph will continue. Clouds may actually thicken during the early evening hours as a weak disturbance tries to stir up a coastal shower. Overnight will then bring clearing skies with lows in the low 30s. Freezing temperatures are possible along and north of I-10/12. Up Next: An area of high pressure will keep quiet weather around through the middle of the week, but this will also hold cold temperatures in place. Tuesday and Wednesday will have mainly clear skies with highs in the low 50s and lows near freezing. By Thursday afternoon, some gradual warming will begin with highs returning to the 60s. The next frontal system will return showers to the area by the weekend. 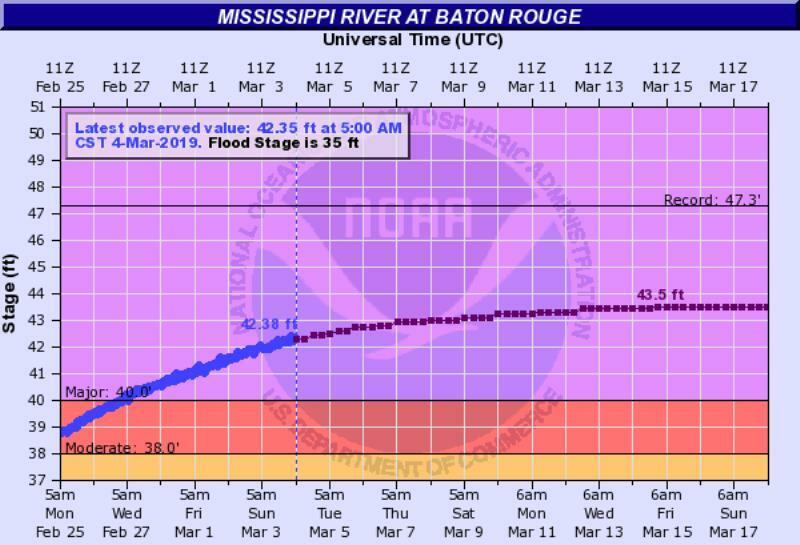 The Mississippi River: At Baton Rouge, major flood stage continues with a level of 42.0’ as of Monday morning. Though the classification of “major flood stage” sounds scary, impacts to land are minimal thanks to levee protection. The high water is primarily an issue for river traffic and river islands as well as a few spots north and south of Baton Rouge that will turn soggy along the banks. At this time, the river is projected to crest by late March at a level similar to what was reached last year around 44’. Low-level moisture trapped beneath drier air aloft will make it difficult for clouds to mix out on Monday. However, as the upper level temperatures cool, the inversion layer should decay enough for some sunshine to peek. As a result, high temperatures will struggle to leave the 40s. A weak, quick moving disturbance will briefly increase clouds during the evening hours and possibly evening stir up a shower closer to the coast. With some clearing late, lows will dip into the lower 30s with freezing temperatures possible north of I-10/12. An area of high pressure will build into the region for Tuesday and Wednesday. This should allow clearer skies but continued northerly winds will keep below average temperatures in place. Another run at freezing will be possible into Wednesday morning. The National Weather Service will consider issuing a freeze warning for part of the area locations as growing has begun for some specimens. By the middle of the week, the surface high pressure will begin to push away to the northeast and winds will slowly take on an easterly and then southeasterly component. 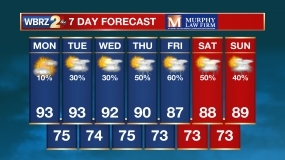 Thermometers will rebound into the 70s and 50s for highs and lows by Friday. The next chance of organized rain looks to come by this weekend. Forecast models hint at a strong system moving through the region Saturday into Sunday. This should bring another round of showers and thunderstorms to the area.